Have You Tried the Voxox Universal Translator? You're planning a trip to Spain. Luckily you have Spanish cousins who can tell you all about where to go and what to do. Unluckily, they speak about two words of English. You've been going back-and-forth running emails through Google Translate and it's taking forever -- don't you just wish you could have a conversation in real-time, in whatever language you want? We do too. In fact, that's why we have the Voxox Universal Translator! The Voxox Universal Translator can make multi-lingual virtual communication easier (and much more enjoyable!) because it instantly translates conversations for you. 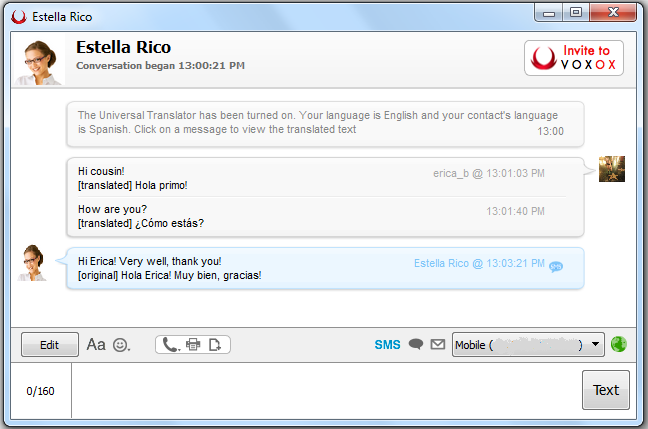 With two-way translation, you can now chat with your cousins in English while Voxox does the work of translating the text into Spanish, and visa versa. It's really that simple! It makes you fluent on the fly -- sending and receiving messages in your native language. Instant 2-way translation of conversations over IM, SMS, and social networking sites like Facebook. Peg a specific language to a specific contact so every communication is translated effortlessly. Available on both the desktop and Voxox Call app for iPhone. The Universal Translator is just one Voxox offering that's helping making your world just a bit smaller, in a big way. Go give it a try and tell us what you think by commenting below or posting to our Facebook page!